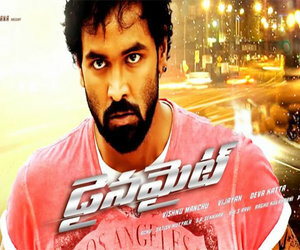 andhrazone: Dynamite Movie Review - 2.75/5 - A Decent Attempt! Dynamite Movie Review - 2.75/5 - A Decent Attempt! Shivaji Krishna (Manchu Vishnu), a self-employee, teaches a fitting lesson to a stalker. Anamika (Pranitha) who witnesses the whole incident begins liking him and even Shivaji gets attracted to her instantly. The next day, They go on a date and fall in love. All of a sudden, Anamika gets kidnapped and Shivaji approaches police. Shivaji tries his best to save Anamika and in the process he meets Rishi Dev (JD Chakravarthy). Who is this Rishi Dev & How is he connected to the Story? Why was Anamika Kidnapped? Has Shivaji chased the mystery? Manchu Vishnu: After Anukshanam & Rowdy, This is his best performance and he carries the mood of the movie so well. Done some of the risky Martial Arts stunts without using a body double and Performed reasonably well in love & sentiment scenes. Even there is nothing to complain about his dances. Pranitha: The entire story revolves around her character and actresses rarely get such opportunities. She performs well in the chasing scenes and also looks glamorous in the songs. Last but not least, She deserves credit for doing some risky action sequences. JD Chakravarthy does a pretty good job in a negative role. Paruchuri Venkateswara Rao, Nagineedu and Ravi Prakash does justice to their roles. Achu's Songs are nothing great & they hamper the flow of the movie to some extent. Background Score is much better. Cinematography is appreciable. Dialogues by BVS Ravi are fine. Fights composed by Vijayan are special attraction. Editing isn't bad. Production Values of 24 Frames Factory are good. 'Dynamite' is an out-and-out action flick with an interesting screenplay. Deva Katta has shot the film in a stylish manner and made sure there was no Tamil flavour. There are few boring moments in the film & Songs act like speed breakers. This film will appeal to a limited section of audience (Lovers of Action & Thriller Movies) and definitely not for those who crave for humour or masala ingredients.